The manner of carrying a firearm is one of the most important choices a responsible gun owner must make. All states now allow for some form of concealed carry, though some restrictions may apply. Many citizens feel most comfortable carrying a weapon, without brandishing it publicly, with reasons varying from individual to individual. Whether you tuck your handgun into your belt, your boot, your jacket, or your pocket, 1791 Gunleather has a premium handcrafted leather holster to suit your fancy. Choose from at least five different types of concealed carry holster, so you never have to leave home without your pistol confidently and comfortably stowed by your side. industry, one holster at a time. We don’t want you to have a drawer full of “okay” holsters. We want to be your “go-to” holster – the one you really love. A 1791 Gunleather holster is designed to be the cherished heirloom you pass down to your children and grandchildren someday, along with your respect and reverence of your Second Amendment rights. I got a (size 5) Four-Way Holster for Christmas. It’s very comfortable with my M&P 45c. Can’t speak highly enough of their products and service. I carry a gun for a living and have no doubt the leather I purchased will last many years to come. I recently met these guys at an event: Great guys, working hard to sell a great product at a great price. Galco and Bianchi are twice the price for half the leather! The leather is nice and comfortable in any position, and it was small enough for pocket carry. I mainly use this holster for conceal, and I honestly forget it’s there. Very comfortable! Though the leather is strong and thick, it has a very soft feel. Soft as butter – I barely know it’s in my boot! Why Would You Want A Concealed Carry? Avoid strangers walking up to you to talk about your gun choice. Avoid strangers walking up to you to proselytize their opinion on the place of guns in society. Avoid perpetrators lunging for your gun to cause trouble. Avoid friends taking advantage of your gun to pick a fight with someone. Avoid closeminded shop keepers judging you for exercising your right to carry. Use the element of surprise to defend yourself against a sudden attacker. Is A Concealed Carry Holster Legal? The legality of a concealed carry holster differs widely by state and local jurisdiction. Most states have a “shall issue” policy which requires a special license to carry a concealed handgun, with owners meeting certain criteria. Federal limits exist when you are within 1,000 feet of a school zone, and state limits may require you to inform police officers that you are carrying a handgun when stopped. Places like American Samoa, California, Hawaii, Maryland, Massachusetts, Nebraska, New Jersey, New York, Puerto Rico, Rhode Island, and the US Virgin Islands have some of the strictest requirements for concealed carry permits. 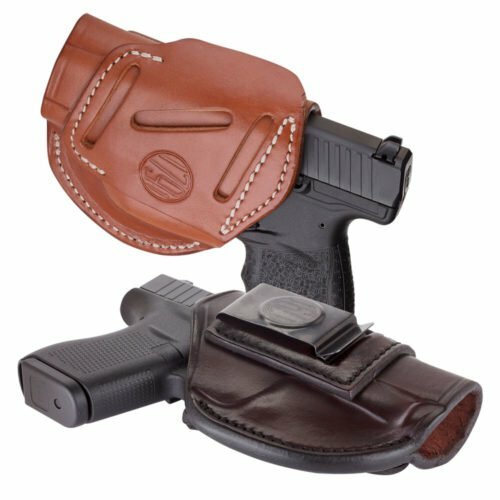 You can find 1791 Gunleather concealed carry holsters available for legal purchase at more than 1,200 dealers in all 50 states. If you’re looking for the very best concealed carry holster, you’d be wise to start with our top-selling model: the 4 Ways Holster or “4WH.” We created this holster with the ideal balance between protection and comfort in mind. 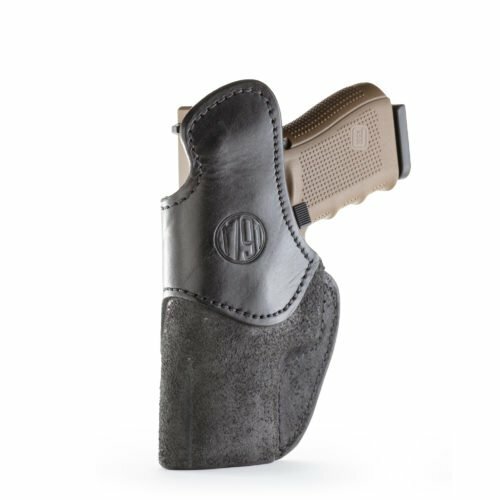 Conceal with convenience in a Vertical, Horizontal, Cross-Draw, or Inside the Waistband carry. Three cant positions are allowed, anywhere on the belt. Choose from Left or Right-Handed style, as well as color (Classic Brown, Signature Brown, or Stealth Black), and size (ranging from “1” for your 1911, to “5” for your Beretta 92.) The 1791 Gunleather 4WH measures 5×4.5 inches and weighs just 0.378 pounds for sturdy, yet lightweight, personal protection. 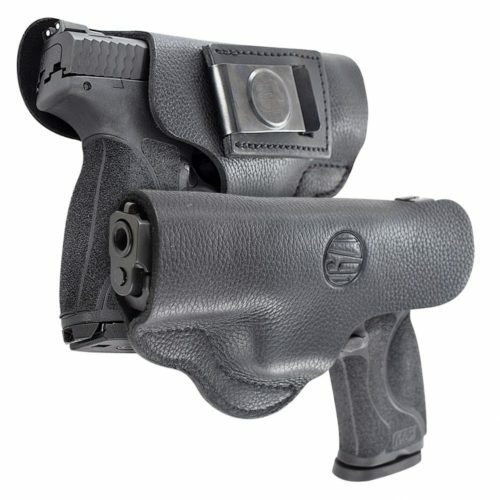 Position: A good holster securely attaches to the belt, close to the body, and does not shift once fastened. 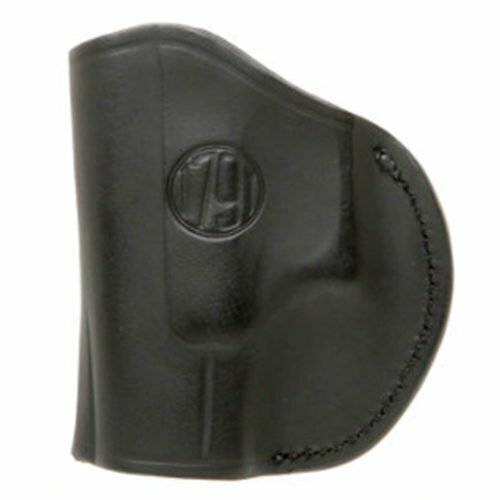 Retention: The best holsters draw easily, but do not fall out if you’re running or jumping up and down. Security: Models may come with a thumb break, retention screw, or open top. Concealment: The holster should not reveal the print of the gun through your garments. Ride Height and Cant: Most holsters let you adjust to different ride heights and angles. Molded vs. Multi-Fit: Some holsters are designed for specific models, while others are more versatile. Manufactured vs. Custom: Our products are individually made by hand, versus pumped out in mass production. Comfort: Many owners find leather has a preferable feel to Kydex plastic or other synthetics. Durability: A higher quality leather will allow for long-term wear that does not collapse or change shape. Re-holstering: Thick, rigid leather allows for one-handed re-holstering where cheap, flimsy materials do not. We are easily accessible by phone, email, or Facebook messenger to advise you on your upcoming concealed carry holster purchase. If, for any reason, your recent purchase doesn’t meet your expectations, you can return the holster at no additional charge for a full refund or exchange. 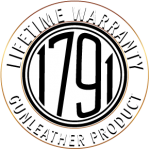 At 1791 Gunleather, you are a valued customer, whether you’re in law enforcement, active or former military, a gun club, or an avid hunter. We look forward to speaking with you and continuing to serve you with trusted high-quality leather gun accessories as only fourth-generation artisans can.